This is something special! Create a unique, personalized buckboard wagon with the wide array of options in the menus above. 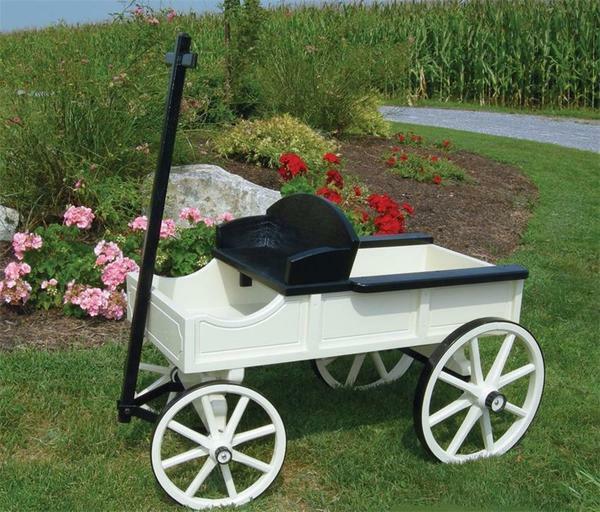 These wagons are available painted in two colors, in block colors or with pinstripes, with wheels or with sleigh runners, or with both. You can even choose to convert your painted wagon into a signature coffee table with a glass or mirrored top - the possibilities are endless! The Amish woodworker who crafts these pieces is also proud to offer to add any hand-painted design to the side of your wagon. Customers have added in birthdays, anniversaries, the names and logos of businesses, or small pictures of treasured memories or pets to the sides of wagons in the past. Simply let us know what you'd like to have on the side of yours and we'll pass your request along. Every piece of these wagons is handmade in Pennsylvania, promising you nothing but the best in home-grown quality and care. If you've any questions, please don't hesitate to give us a call or an email - we could talk about these wagons all day! You can also stop by our Amish furniture store in Sarasota, Florida near the Pinecraft Amish community here. Width without Lip: 17 1/2"